We are getting ready to take our annual trip to the pumpkin patch! It’s such a great opportunity to capture kids being kids. Really, any fun activity is a great opportunity, but holidays lead to such great settings. 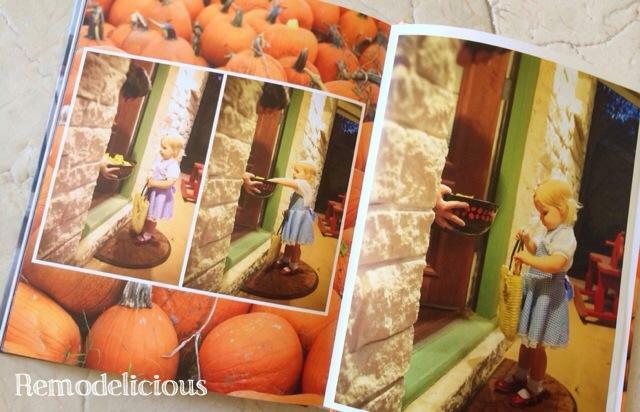 Our photos from last year turned out so great, that I ended up making an entire photo book just for “Halloween 2012”. As usual, I ordered this book from Blurb with a white binding for a clean, uncluttered look on the shelf with our other family photo books. I create these books for birthday parties and big events and also as family yearbooks. Here’s my advice for making a great photo book from taking the best photos to arranging photos for the best results. Most importantly, snap away. Who cares if you’re the crazy paparazzi mom in front of people you’ll never see again (or friends & family who shouldn’t be judging you anyway) when you get amazing photos that you will keep for your entire life and then pass down to future generations? When you string all of the “extra” shots together, you can get a fun sequence leading up to a “money shot”. Get in close and don’t be afraid to move around a lot to get the best angle. You need to pay attention to your subjects, but also the background. We hit the pumpkin patch when the open even though it means getting up early and eating breakfast in the car. It’s worth it to avoid the heaviest crowds for our enjoyment and for our photos. If you use a low f-stop (links for the best lenses & quickly lessons on this below). This will blur the background (including the crowds). When you absolutely can’t avoid it, like the photo of Chloe below when she was standing in a crowd, you can edit the photo later to add a vignette or Bokeh effect. Over-simplified, Bokeh is the blurring you see in a photo that draws your eye to the non-blurred subject. There are add-on photoshop filters & Apps for this. Coordinate outfits. They don’t have to match, but some sort of color scheme whether it’s a single color of palette of colors will bring the group together visually. 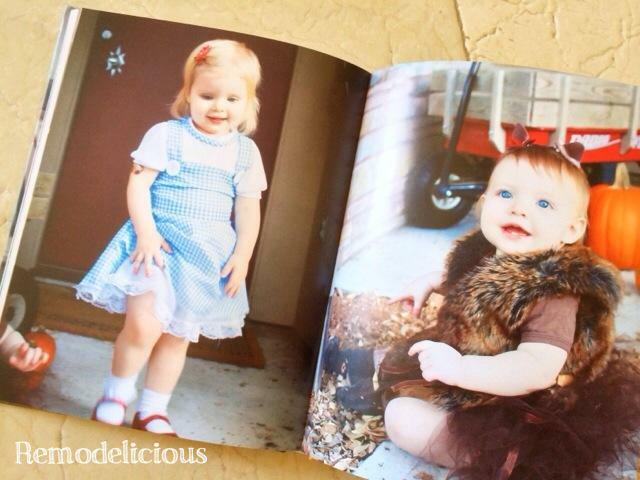 Last year Chloe’s outfit was inspired by her Halloween costume, Dorothy from The Wizard of Oz. Cora wore a blue vintage dress that I had been dying to photograph her in that was a soft, sweet version of the colors Chloe was wearing. Perfect for baby’s first visit to the pumpkin patch. You may think of coordinating outfits for formal portraits, but it also will make s huge difference in everyday photo opportunities. A little planning makes a huge difference. Blue was also a great color for a pumpkin patch because it is orange’s opposite. Take a moment to think about colors in relationship to each other. Photo editing can make a huge difference. Your job is only half done after photos are taken. There are tons of different techniques, filters, Photoshop actions, and effects out there. It comes down to personal preference and what software you’re comfortable with. It’s trial and error so I always make a duplicate copy to edit in case it really doesn’t work our (or I just change my mind). There’s no one-stop shop, so search online and keep your eyes pealed on Pinterest for tips & techniques. I often like to brighten subjects and darken edges in moodier, fall photos. I like to add a touch of saturation in most cases. Photo editing is more an art than a science, but is well worth putting some time into. Mix staged photos with candid ones. This goes back to just keep shooting. Who cares if you wind up with 1,000 photos to go through. You’ll end up with 50 gems instead of 3. You can always delete what doesn’t work later. Don’t forget to take shots without the kiddos as well. I always stop to take a few scenery photos both up close and from afar. They work great as backgrounds and mood-setters. Don’t worry about where they will go in a photo book when you’re taking them, just take a moment to take in the scenery with your camera when you see something with pretty textures and colors or that really describes the scene, like a pile of pumpkins at the pumpkin patch and the rusty farm truck set up as a photo backdrop. Pay attention to which direction people and objects are facing. To give Chloe something to “look at”, I placed her on the right hand page and placed a scenery photo on the lefthand photo. 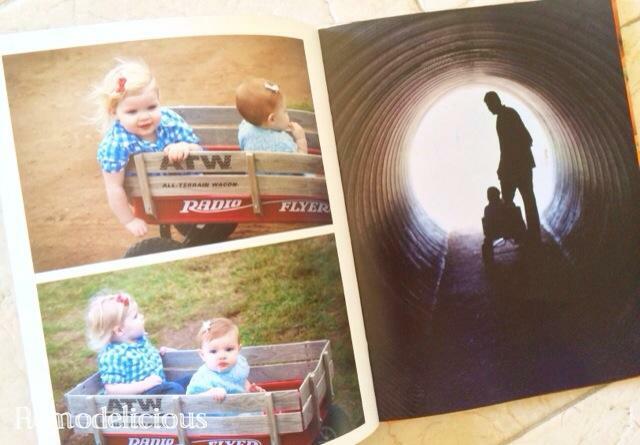 When making a book, take advantage of Blurb’s 2-page spreads to highlight favorite photos. Tell a story with photos with placement. Between photos of searching for the perfect pumpkin and enjoying farm activities, I used a spread to show us traveling from one thing to another. 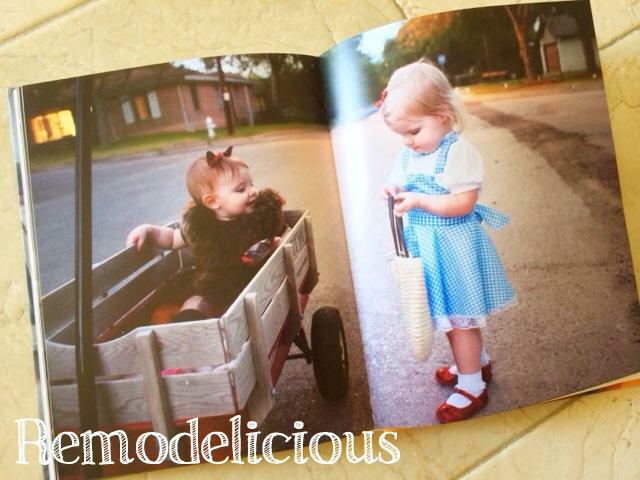 I include an intro page on each of our photo books that sums up what we did and who we did it with. I don’t have to create this every time. Blurb lets you save your own page and book templates. It’s always about telling the story. 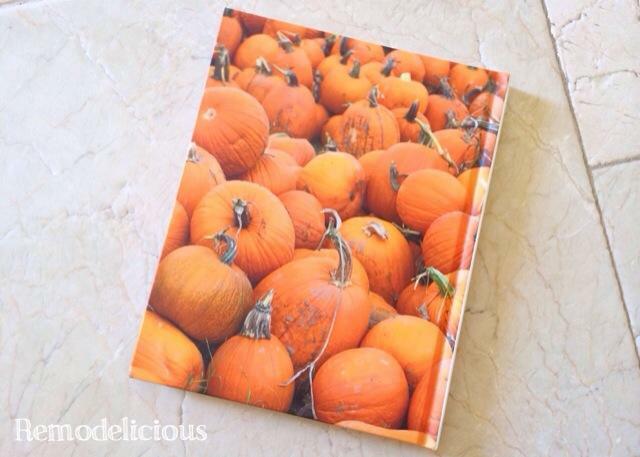 After seeing our pumpkin patch photos, I knew I wanted to make a photo book. 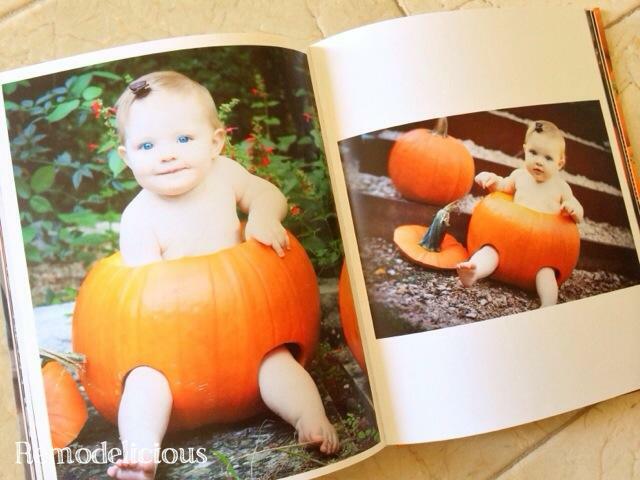 I waited until Halloween was over so that I could include photos from all of our Halloween activities, including our token Baby in the Pumpkin photos. I made a solid attempt to get a cute photo of the girls together in their Dorothy & Toto costumes, but sometimes that planned shot just isn’t going to happen. I either got a cute photo of one or the other. Sound familiar? Sometimes it’s just not in the cards. Don’t get discouraged, individual photos can be great as well. And you’ll also be taking a lot of candids as well, right? Candid shots tell more of a story than posed shots. I end up using more of them. When I end up with a great one, it gets a 2-page spread, usually complimented by what led up to that moment and what followed. Don’t be afraid to use photos taken at another event (like the pumpkin patch) as a background for another moment (like Chloe’s first ever trick-or-treating stop). Don’t neglect the back cover. It’s a great spot for a scenery photo or even something that just didn’t quite fit the book. This is still one of my favorite photo books and I go back to it often for the memories and for inspiration on other photo books. Don’t use the flash. If you get the right lens & settings, you don’t need to. Get the best natural light you can. Outdoors is best, especially in indirect light (like on a cloudy day, dawn, or dusk). When indoors, open up the blinds & turn on the lights. Photograph kids in their natural environment. The best photos we have are happy accidents. We dressed them up how we wanted, put then in a nice setting, and went with it. Limit set-up/posed shots. Just pick one or two to try, but don’t force it. Bribery may be necessary. Rapid Shoot. They are digital photos that take up no physical space in your life and can be deleted easily. Clear off the memory card and go nuts. Then pick your favorite and delete the rest later on the computer. You may feel ridiculous at first, but the results are worth it and you’ll get used to it.